If you choose not to use the listings tables, OR, if your customer is enrolling in multiple classes during their initial registration, they will need to use the 'ENROLL IN CLASSES' or 'REQUEST CLASSES' section within the Web Reg Form to add additional classes. If you allow enrollment during registration, the form will have a "SELECT CLASS" button to view and select classes. If the class was chosen from the Class Listing table, it will follow the customer into the Reg form and be pre-filled into Class #1 position. Perhaps you have some Cats that are not applicable to online class registration, such as "Material Fee". To prevent a specific Category name from appearing in the drop-down list, go to Tools > Edit Settings>Drop-down Lists > Cat1 (or 2 or 3), and mark it as Hide from customer. Those marked Hide from customer will not appear in the dropdown list in the filters. To allow students to get on the Wait List for classes that are full, enable "Allow Waitlist when Class Full" on the Settings page. This will allow full classes to display in the list of available classes, and they will have the word "Waitlist" in the Openings column. If a student uses the online Waitlist link, it will simply place him or her on the Waitlist in your database. Waitlisters are never automatically enrolled. Your Dashboard has alerts to let your staff know when an opening becomes available in a class that has at least one student on the Wait List. 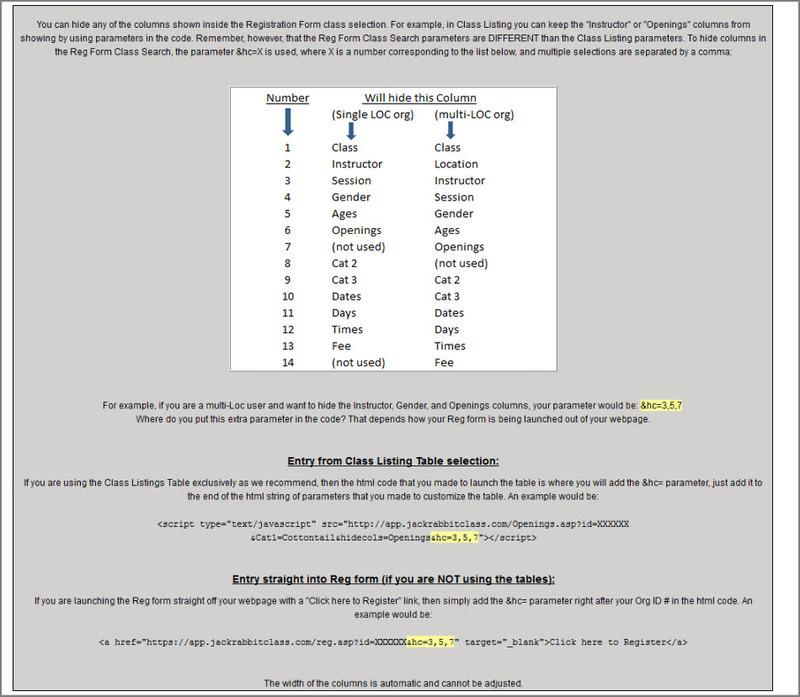 Then your staff will enroll the top waitlister into the opening. If you do NOT want to allow your new customers to enroll themselves into specific classes, make sure you have the "Ability to Enroll in a Class" set to NO on your Web Reg Settings page. However, if you do want to allow new customers to choose and enroll into classes, set "Ability to Enroll in a Class" to YES. You also need to ensure those classes meet the criteria for being available for online enrollment. 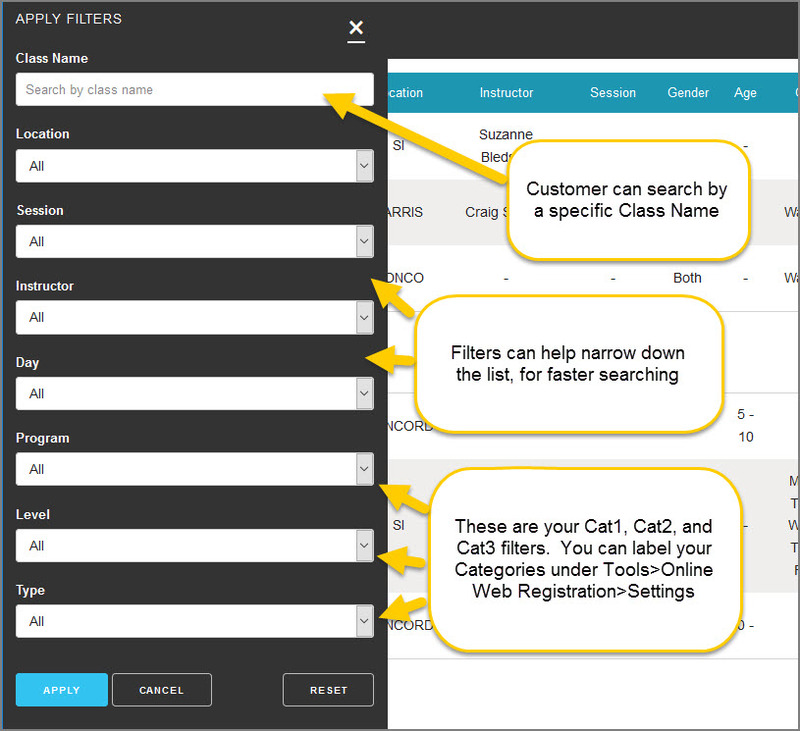 Each class should have the following completed, at a minimum, on the CLASS Summary page in your database, in order to be shown on the above search page.